I think if we, as an education community, remain only on the pedagogical level, then we’re missing the point. Conversations about student agency need to dive down below the pedagogical to the philosophical and also political level. As educators we must be critically thinking about and engaging in conversations centering around: power, compliance, control, democracy, freedom and children’s rights. 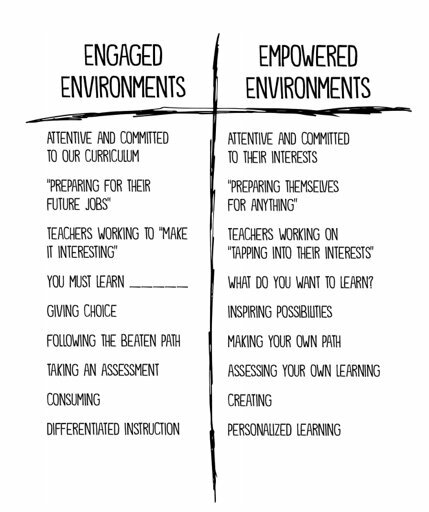 Specifically what those concepts look like… or don’t look like… or should look like… in schools and classrooms. Yet, this is quite hard hard to do because many of us are products of the education system ourselves. Which means we have 20, 30, 40+ years in the current paradigm – both as students and then as educators. This can make it very difficult for us to stand outside the system in order to objectively and critically analyze it. So I think it’s crucial that we continue to provoke our own thinking, and each other’s thinking, about these concepts. And one of the best ways we can do that is by choosing to expose ourselves and each other to provocations. Different stimuli that make us confront our own thoughts and feelings and presumptions and biases. Things that make us not only think, but also feel. Things that provoke our emotions, as a way to notice, explore and understand our own thinking. Over the past year I’ve been slowly collecting an array of provocative quotes, tweets, images, cartoons and sketchnotes that I’ve come across that have provoked my own thinking and emotions. I’ve begun to share them in the workshops I lead about student agency to help other educators confront their thinking and feelings too. So I thought, why not share them here as well!? So here is my personal collection of student agency provocations to get us, as a larger education community, feeling… thinking… discussing… not just about the “how” of student agency, but more importantly about the “why”. What student agency provocations would you add to the collection? What has helped provoke your thinking about power, compliance, control, freedom and children’s rights? Recently on Twitter I shared a Google Doc where I have been collecting and collating anything and everything I can find about student agency over the past few years – blog posts, videos, images, podcasts, slideshows, academic journals, articles and more. And I’ve received a really positive response from educators around the world, appreciative of the resources. Since I know not everyone is on Twitter, I thought I’d share the same resources here to hopefully reach even more educators wishing to deepen their understanding and practice of respecting and supporting student agency! If you prefer the pretty, colour coded Google Doc click here. If not, check out the links below. Accept a piece of homework, even if it’s 10 years late. This post was originally posted in my blog Ser y Estar. I started teaching when I was 22 years old. I used to teach EFL in Mexico, and many times, as I was getting my class ready, I was asked if I knew were the teacher was. I moved from teaching EFL at language institutes to teaching Foreign Language/Language B/Language Acquisition and later on Language and Literature at a bilingual school in 2002. At that time, I also collaborated in a Cultural Radio Station, and was doing theater. This is the first time I ever write about my journey in a blog entry. I used to teach in High School, and was one of the youngest teachers at the school where I used to teach. I used to think that being young was what helped me connect with students. Then I started thinking that being involved in the radio and in theater and always having something to talk about is what helped me bond with them. But it was later when I stared developing the pleasure of listening to my students’ stories and dreams when I think I started shaping the form of the teacher I am now. It was 2006; at school, discussing the book “Memoirs of a Geisha” and making comparisons with the movie was a ‘hot topic’ with my students, especially when I introduced them to a telenovela that was popular when I was a child: Oyuki’s Sin, a Mexican Telenovela based in a Japanese context- those were the days of real creativity. The best part of our discussion emerged from looking into “what may happen when a foreign context (Japan) was used to give life to a story whose characters were very Mexican?” I don’t think I was even aware of the word ‘inquiry’ at that time, let alone interdisciplinary learning, but it just felt so right to do things that weren’t necessarily just about ‘language’ in a traditional conception. Thus, we started talking about how we could use one of our favorite stories originally written in Spanish and use Japan (since we were talking about a lot) as a context. The objective was to write a theater proposal for a group of potential sponsors, in the hope that they would agree to finance our play. The exchange of ideas was great; students were speaking without my constant reminders. It was noisy, but it was meaningful. Questions navigated the waves of energy in the classroom: What colors would we use? What language would characters use? How could we choose the best names for our characters? I invited a few Art teachers and a few others from the school of Marketing to serve as the potential sponsors, and my students presented their projects to them. Needless to say, my students were petrified, but they knew what they had to say so well, that once they felt how their ideas impacted their audience, they gained confidence and managed to get the fictional aid they were aiming for. I was proud of them, but I was partially unhappy for one of my students was not able to present. He had not finished his proposal and decided not to go to school that day. I had read descriptions of this student had and seen illustrations of how he envisioned his stage (See below). When I checked my email and saw his apologies for not being in school and asking me if he could submit this task later, I could not say no. We had invested so much thinking and energy in making this happen that everyone deserved to show their work. Sadly, due to work of his father, they had to leave the city a few weeks later. I had not yet received “his homework”. I left Mexico in 2007, and I never saw what this student of mine could have produced. The incomplete homework I received via email in 2006. I had resisted joining Facebook, but gave in when I found it practical to help me connect with my friends and family in Mexico. I soon started connecting with past students of mine too. Obviously, I connected with this student I have been talking about as well. We never discussed that homework again. Our passion for music, cinema, and literature remained the main topic of our conversations. Then all of a sudden, a few months ago, as I was reminiscing on my experience doing theater, and as he shared how he has taken the short films he’s made to films like San Sebastian and even Cannes, that legendary homework came up and he said: “I actually have to show you something; it’s not red; it’s not Japanese… But there is a Japanese face, and it has a Japanese title (Tomoki= Wise Tree)”. A deadline that was not missed, and a late submission have never been more welcome. He had done this 2 years ago, and I was seeing how his life experience had transformed what he did with paper and paint into a beautiful universe of light, movement and image. I had to wait 11 years for that incomplete moment to come to a closure, and the wait has been so worthy. As I reflect on what I value in my journey as an educator, relationships always comes as a high-ranking value (maybe the highest). I believe that a lot of the ideas I come up with and the journeys I design make sense and HAPPEN because they are designed for the students I have at that moment, they are never replicas of something I did before. In 2006 I used my blog to write about my theater journey. However, here is one of my very first blog entries about education. I remember that I started to write a reflection about one of the female characters in the play I was participating in and could not conclude it. I changed the content of the blog and wrote a note of appreciation for my students. In retrospective, I think that the day I wrote the blog post linked above was that day when I realized I wanted to be the educational version of Peter Pan: I wanted to stay a learner… I wanted to stay curious and full of possibilities at heart… Rebel at heart. Nurture what matters: Get outside and play! Every weekend I go to my favourite place to play. A two hour drive south of Luanda is a great beach with consistently fun surf. On this morning, I stand on the beach crunching on my apple – sweet and salty, the fruit mingling with the salt water still dripping in my mouth; a salt crust forming on my skin where the water is already evaporating in the 9 am sun. The water’s starting to get busier as it does on Sundays and a family from my school has already arrived with their two kids out in the water for their surf lessons. I spot the older one in the water and notice an approaching wave. Under my breath, I cheer him on. “Paddle, paddle! Up! Nice!” He surfs a great wave, cruising along the face. I can see his face from where I am and it’s a picture of intense concentration mingled with joy, excitement, and maybe some disbelief. He surfs the wave for a long time adjusting his speed by shifting his weight on the board and making small changes in his position on the wave, anticipating the cresting water. As he’s falling off the wave, he throws his hands in the air with excitement, celebrating his wave. I smile to myself and give a nod of approval. As I write this, my mind is going through all the learning that happened in that moment and how it translates to the classroom and life. In surfing, we talk about “reading a wave.” That means that you can determine where a wave will break, the force it will exert on you, how to use the force to generate speed as you surf it, when to avoid a wave, and more. In a broad sense, this might be considered water literacy with reading waves, a small piece of a much bigger puzzle. Much like literacy in other areas, it requires a lot of practice. Along with reading waves, this student is learning about ocean currents and water safety. These are skills that might help him or others stay safe around water in the future. As his mom pointed out to me, the lessons are also helping him learn Portuguese as his instructor is a Portuguese speaker and local Angolan. Finally, he is developing certain attributes that will contribute to his growth as a person and lifelong learner. From surfing, he’s learning resilience, commitment, respect for the ocean, appreciation for nature and his host country, and the joy of learning something new. I finish my apple, take a drink of water, and pick up my board to head back out. As I’m walking out, my student walks out of the water with his board and begins walking back up the beach toward the point, joining my path. “Nice wave!” I say to him. “Oh, hi Mr. Brodie. You saw it? That was my best wave ever! I rode it for a long time! !” He goes on to explain to me what he’s learned about the waves at this beach, how they break, and how best to surf them. And then he says something that is music to my ears. You see, for Year 7 outdoor education, I planned an overnight trip to this beach and coordinated lessons with the local surf school. The trip was a resounding success and the students had a part in organizing it. Through trips like this, students are given opportunities to step out of their comfort zone and engage in new experiences. Sometimes these are as simple as leaving the compound (here anyway) and experiencing part of your host country. I’ve also recently started a course with about 20 of my colleagues called “Exploring What Matters: The Action for Happiness Course.” Last week we learned about the 10 keys to happier living. Reflecting on my experience with this trip and the subsequent discussions I’ve had with students and teachers involved, I’ve realized that at least five of these keys were part of the learning experience. This helps explain why on each of the three excursions we have taken the year group on, I’ve been struck by their growth as a community and the depth of learning that happens. These hands on, real world experiences are so impactful for our students. Especially in the middle years as their world view broadens and navigating situations with their peers takes on the utmost importance. I can’t help but wonder why we don’t do this more. How often do you take your students out? Do you play too? How would your ideal program incorporate experiential learning, excursions, and play at different ages? What examples do you have of students developing sustained passions? And, finally, where does student agency fit into this? Shifts have been a big part of my career as an educator. International educators, and many of our students, experience this much more than our national counterparts: shifts in school culture, shifts in curriculum, shifts in colleagues, and shifts in education trends. One shift I’ve wanted to make completely but have really just been dipping my toes in is student agency. You see, while I wouldn’t call myself an early adopter, I’m enthusiastic to break the traditional mold and try things that might reach more of my students. As someone who loves to learn but struggled with my traditional education, I’m eager to find as many ways as I can to coax the love of learning out of my students. When I first experimented with student agency, Gary Stager, author of Invent to Learn, paid our school a visit and encouraged coding in the classroom. 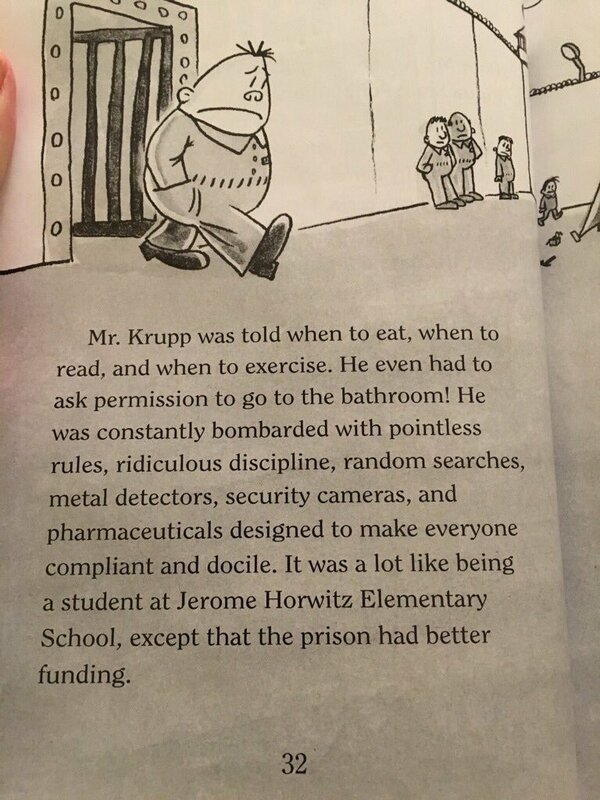 But it wasn’t the coding or use of Microworlds that stood out to me, it was one thing he said, almost off-the-cuff, “Why not let kids make their own schedules?” This got me thinking, ya why not? I was teaching Grade 2 at the time and was quite new to the PYP and international education but was being encouraged by my leadership to take risks like this. So, I experimented, saw the merits and challenges and put it in my toolbox. I then continued on with my learning of the PYP, getting ready for accreditation, and giving students ownership where I felt I could – working within the system. Shifting to MYP was a considerable change; more so than I expected or realized at the time. Unfortunately, it meant that in the first year, I wasn’t dipping my toe into the pool of student agency as much or taking it out of my toolbox very often. Sure, I was still having my students set their own learning goals and encouraging student inquiries. However, it seemed to fall flat as I was doing what I was told was the way to deliver English Language Acquisition units and assessments. But the curriculum and assessments seemed to be getting in the way of learning instead of enhancing or encouraging. When I found myself feeling kind of bored, I got concerned. If I was bored, my students definitely were too. This can’t be right! Then the work began: rewrite units, have students write units, change assessment practices, and put the learning in the students’ hands more often. Thanks to Taryn Bond-Clegg’s posts, I was reminded of my toolbox and a colleague and I instituted a workshop structure during a unit in which students were exploring creativity through poetry, spoken word, and songs. It was a real success and gave the students and teachers many great learning experiences. During this shift back toward the students and away from the institution, I have been reminded of a blog post by Jonathan Field about school leadership and I think it applies just as well to teaching. He says, “start with a YES and see where it takes you.” Recently I’ve found the word “Yes” becoming a bigger part of my daily vocabulary and it feels great. How often do you say “yes” to your students? A few weeks ago I shared my thinking about how best to structure professional development focused around student agency, and this past weekend I had a chance to test it out! I spent the day with an amazing group of passionate and dedicated educators all committed to upping the amount of voice, choice and ownership in the work they do to support their learners in their specific role. The first thing I knew I needed to do was get to know them as learners. So I sent out a quick Google Form that helped me begin to understand who they are and what they are hoping for from our time together. The results were very informative and helped me put together a day of professional learning about agency tailored to their needs. 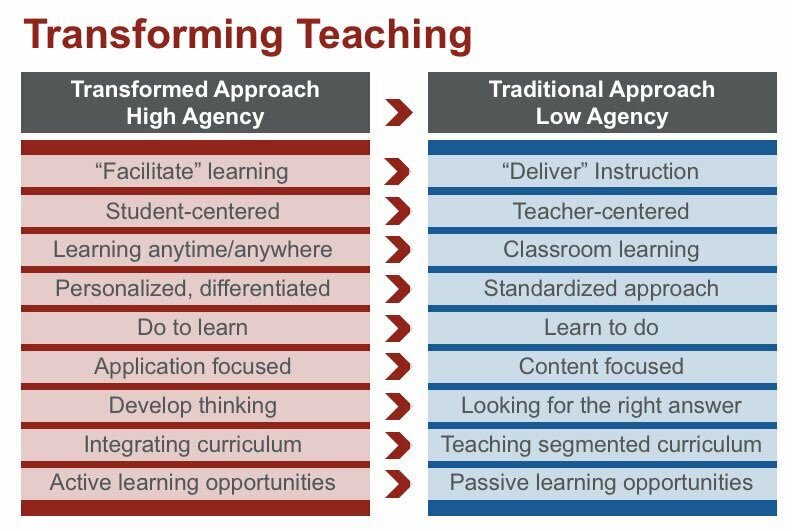 From there I focused on building a workshop where they were able to not only learn about learner agency, but learn through experiencing their own agency as learners. All of my planning and decisions were guided by the question, “How can I help them learn about student agency” instead of focusing on “How can I teach them about student agency”. Before the day of the workshop I also spent some time putting together a virtual learning space, our own Google Classroom, to help distribute documents and resources. I knew that not all participants were comfortable on Google Classroom, so I insured that there were plenty of other options and avenues for accessing resources and using some of the templates. When participants arrived the day of, I made sure they all had access to the presentation slides – which were editable – as there were a few activities where everyone would need to contribute thoughts and ideas. First we started with a simple activity to help them connect with each other, the topic of the workshop and their own experience as a student. Then I was transparent about the structure of the workshop – Choose, Act, Reflect – and my thinking behind it. Everyone took a turn to share how they were planning to document their learning throughout the day, and it was so great to see so many different approaches! After that, it was time for them to plan their day! I took some time to give them an overview of all the different possible options that could support their learning throughout the day. I previewed the resource document that I built for them. First we started with an opportunity for them to tune into their own understanding of what they think student agency is. Next we moved into a “Tug of War” to help them debate and discuss a variety of underlying beliefs, assumptions and philosophies connected to agency. Then, I had them use a quote from the Empower book to challenge them to think about which of those decisions learners “should” or “could” be making themselves. Then I invited them to visit other groups and leave some feedback to push each other’s thinking a little further. Finally, I had them reflect on any shifts in their thinking as a result of the activity. First I introduced a few self-reflection tools, to help them see where they are already respecting and supporting student agency and also where there might be some space to make some changes in their practice to work towards even more respect and support for student agency. I only had one conference slot filled about agency vs. the curriculum. We sat and chatted for 15 minutes about questions, challenges, ideas and resources. I was so fortunate to have 4 amazing educators donate some of their weekend to support the learning of people in the workshop. and everyone chose the style and content of reflection that was most useful and comfortable for them. It was great to see such a wide range of approaches to reflection! Everything from painting, writing, sketching, talking, sleeping… to even graphing! And how leaving your comfort zone often leads to something amazing! Finally, before they left, I asked if they could share their honest feedback with me about the day. I wanted to make sure I was honouring their voice as learners! Reading through their feedback was so helpful. It helped me reflect on what parts of the workshop worked really well, and also some parts of the workshop I need to revise for next time. At first I started to go down the path of regret and all the shulda, coulda, wouldas…. but then I realized that just because the workshop was over, didn’t mean that my support for their learning had to end! So I decided to take action and respond to what their feedback was telling me. I made two Google Slide presentations (linked above) – one to address each area that seemed to be missing from the workshop. And I sent those presentations to the workshop participants via our Google Classroom and email. Now I can feel a little bit better that I honoured their voice as learners, and took action to respond to their needs… even if it was technically “after the workshop”. How do you support educators in developing their understanding of student agency? What feedback do you have for me as a workshop planner/facilitator in order to better meet the needs of my learners? What a great feeling to see that learning from the workshop lead to action that resulted in happy, successful teachers and students!!! It is sooo amazing to see/hear/read about all the buzz around innovation lately! There is such great momentum for pushing the envelope and making real changes to the system. And with that awesome energy can sometimes come a “transplant” type of thinking. And that type of thinking is kind of like cloning a plant that’s thriving somewhere and plopping it down somewhere else. …and then wondering one or two years down the road why it’s not flourishing. Was the soil right? Was there enough sunlight? Was it in the right temperature? Were there gardeners who were willing to tend to it? Was it even the plant you wanted? Sometimes all we see is the plant – because it’s what’s most visible – but we neglect to think about all the factors that contributed to what helped it grow in the first place. Sam Sherrat has a great blog post called Studio 5: It Took More Than 7 Days. Which gives great insight into the 3 years of thinking and planning that went into Studio 5 to make it what it is today. As well as this first post in a series where he breaks down (more specifically) the different stages of our evolution process. So in keeping with my plant metaphor, here are some suggested steps to help you grow your own innovation! Start with your own why. What do you believe about learning? What do you believe your children deserve? What do you believe about the future of education? What are you hoping to achieve or accomplish? What dream are you working towards? If you could sum up your mission in one sentence, what would it be? Commit to your mission. Write it down. Share it with stakeholders. Be transparent about the vision you will be working towards. Work towards poking and provoking thinking to help people value and believe in it. Next, tend to the seed. Germinate the idea. Take time to brainstorm possibilities. How could you achieve your “why”? What are all the different ways you could bring your mission to life? What may work, might work, could work…. Take time to inquire as a staff. Give people a chance to expereince the type of innovation you plan to implement for students. Find resources to extend everyone’s thinking and understanding of whatever it is you want to do. Prune the plant as it grows. Continuosly, go back to your “why”. What are you doing that’s helping achieve it? What are you doing that’s preventing you from achieving it? What do you need to start, stop, continue in order to honour your original mission. Know that the process is iterative. It’s so great that so many schools want to innovate, but if we want our innovations to take root and really thrive we need to make sure that we are developing innovations that can grow and blossom in our specific contexts.. with our specific beliefs… our specific students… our specific teachers… our specific community. Brainstorm all the possible “how’s”. And be prepared for endless iterations. Copy and paste the process, not the innovation.